TVS has unleashed a power-packed machine with its Apache RTR 200 4V Race edition 2.0. 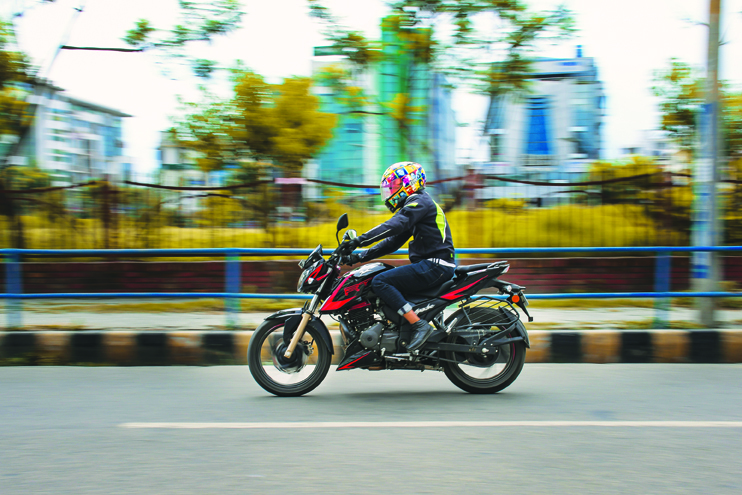 TVS has been distributing its motorcycles in Nepal since a very long time, including its famous and bestselling Apache that was introduced in 2005. Apache has been a favorite amongst the bikers due to its power-to-weight ratio. Apache, from the initial stage of the production till date, has had many upgrades. In 2018, the Apache has been updated with anti-reverse slipper clutch, and with the tagline of Race Edition 2.0, in accordance to the update of the previous race edition. TVS has entered the competition of developing motorcycles with racing technologies with the all new Apache, and has scored various awards in 2017, including national and international awards. The first in the 200 cc class, the all-new Apache is a naked race edition street motorcycle. The Apache segment has been various popular due to its light-weight build and the balance in the power delivery, which is competitive with other motorcycles in the same segment. The introduction of the Apache RTR 180 in 2012 was quite the boost the company needed for the Apache motorcycle. The all-new Race Edition 2.0 has been upgraded with slipper clutch and racing inspired decals, which give the motorcycle a sporty appearance. Similarly, the champagne gold front suspension forks also add to the sporty appearance. Also, the split seats with side vents support the aerodynamics of the motorcycle. The LED lights in the headlight and tail lights also give the motorcycle a sporty detail. The mini-windscreen covering the instrumental panel and muscular tank provides the extra sportiness. The tagline of ‘Racing Edition’ does not just end as a tacky tagline. The motorcycle has been built with racing-inspired upgrades and technologies, starting with the race-derived O3C tech engine which is a 4-stroke oil-cooled type with ram air-assisted cooling that reduces the engine heat map by 10 degrees Celsius. Thus, while riding in continuous high rpm and high speeds, the engine will support accordingly for high power and reduces risk of power reduction. The engine also has a high combustion Nanofriks-coated piston that enhances the 200 cc power. Similarly, the racing double-barrel stainless steel exhaust exerts the racing roar, but in a low frequency sound. Likewise, the chassis has also been developed with racing origin split cradle design, which supports balanced control at high speeds as well as the flexibility for cornering. Adding to this, the race-tuned rear monoshock has a floating piston shock absorber with precision-tuned compression, along with rebound damping. The suspension plays a vital role in racing-inspired motorcycles, because the balanced play of suspension results in the riding comfortability and confidence for high-speed riding, as well as for cornering. Furthermore, the remora racing types is believed to have good grip for track racing. Lastly, the A-RT (anti-reverse torque) slipper clutch system that has been introduced in the RTR 200 4V is a highly advanced and a reliable feature. The A-RT slipper clutch reduces back torque to a minimum, which allows aggressive downshifts, thus avoiding wheel hopping, which is a common problem while riding in high speeds. The primary role of this feature is to enhance the quick launches and easy upshifts, which help in the initial torque, as well as decreasing the time lag of shifting gears of traditional clutch-pull and shift technique. Thus, with this feature, the rider is enabled rapid movement, which decreases the lag in power while shifting gears. Talking about the specifications of the RTR 200 4V; the 4-stroke oil-cooled engine produces a maximum torque of 18.1 Nm at around 7000 rpm. It also has an oil cooler along with Ram Air, along with a twin pipe and twin barrel design exhaust system, which enhance the performance of the motorcycle with roaring exhaust sound. The headlights are H4 bulbs with all-day-on LED. The RTR has a 12 L fuel tank capacity with 2.5 L in reserve. The front and rear brakes are 270 mm discs with ABS, with RLP control on the racing color variants. In terms of the performance, the company claims a maximum speed of 128 km/h in 5th gear and goes from 0-60 kmph in 2.95 seconds. The RTR 200cc 4V Racing Edition 2.0 has been manufactured to compete with other motorcycles of the same segment with advanced upgrades, which will challenge the performance of other motorcycles of the same segment. The RTR 200cc 4V is available 7 sporty color variants. Similarly, the racing-inspired graphics are available in black, matte grey, and white. The motorcycle has a price tag of Rs.324,900. Finally, the RTR 200cc 4V is a remarkable ride for daily ride as well as track racing. It gives good competition to its competitors, such as Pulsar NS 200, Pulsar 220, and the Yamaha FZ.